Referral Program | Ezee Credit Leasing and Sales Inc. If you have any friends, relatives or co-workers who may have had trouble obtaining auto financing, we invite you to tell them about Ezee Credit – and tell us about them. Just fill out the Referral Form below and submit it. We'll simply make a follow-up call your referral (don't worry, we won't hassle them) and offer to assist with their vehicle buying needs. 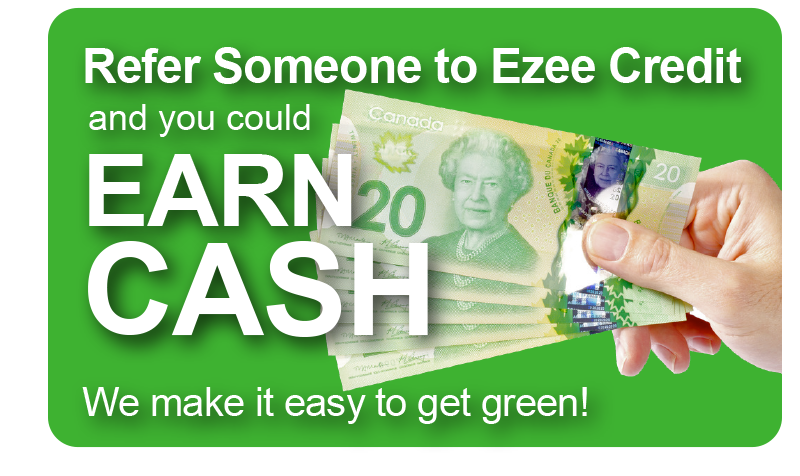 If they end up purchasing or leasing a vehicle through Ezee Credit after you referred them, we'll give you a $100 cheque in appreciation – or – If you're already an existing Ezee Credit customer, we'll credit your account by $200! It's a win-win! You get a reward, and your friend or family member gets a quality Ezee Credit vehicle and all the good things that come with it. There's no limit on how many referrals you can send. So go ahead and start sending us some names!